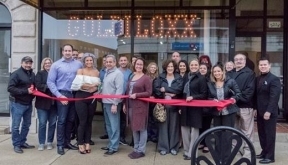 Goldiloxx Hair Studio located at 3214 S. Grove Ave, is an independently owned and operated hair studio offering a variety of services, from men’s and women’s cuts to Brazilian Blowouts and hair coloring. A ribbon cutting was held in partnership with the City of Berwyn and the Berwyn Development Corporation (BDC) on February 24th. Cynthia Anne Citro is the proud owner and Master Colorist/Stylist of Goldiloxx Hair Studio. For the last 14 years, she has catered to clients throughout the Chicagoland area, including celebrities, socialites and everyday people. She enjoys providing each of her clients with the “star” treatment and prides herself most on performing creative and corrective coloring while keeping the integrity of the hair feeling and looking undamaged. Citro has catered to clients from LaGrange to the trendy Gold Coast neighborhood, but she is excited to bring her talent to her home town of Berwyn. For more information on Goldiloxx Hair Studio, please visit www.facebook.com/Goldiloxx-Hair-Studio or call (708) 317-9010.